Each morning when I awake, I still find it hard to believe that Barack Obama is really our President. I started reading his autobiography, Dreams from My Father; I find it inspiring that we now have a leader who is a good writer, felt an early calling to do public service, and lived abroad as a child. By popular request, here are two dozen photos from the Kyiv Inaugural Ball. Feel free to download these photos for personal use. For other purposes, contact me. To get high-resolution copies of these photos, email the event organizers, Democrats Abroad in Ukraine. Eventually, they will also put photos on their website. Click on each thumbnail to see a larger version. Enjoy! 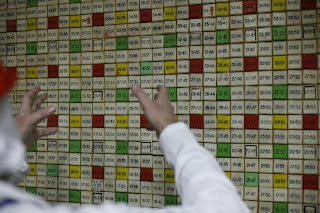 An inactive information panel in Control Room 1 of the Chernobyl Nuclear Power Plant showed the status of all the fuel rods in the reactor pool. The Chernobyl plant has been inactive since 2000, but it took Ukraine's Verkhovna Rada (Parliament) until last week to approve decommissioning. Depending on your perspective, this is either big news — because it allows for the nuclear fuel rods to be finally moved to safe storage — or unimportant, because it is just another small bureaucratic step in a 75 year clean-up process. The day after the law passed, I had my first opportunity to visit the inside of the Chernobyl plant. 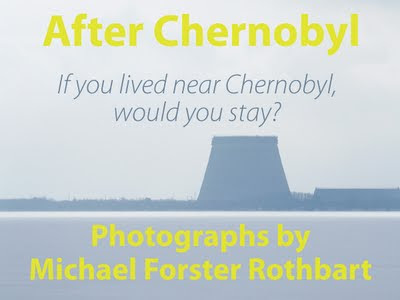 Once I have time to edit and organize photos, I will post a description of a day in the life inside Chernobyl. Ukraine celebrated the inauguration of Barack Obama with a giant formal ball in Kiev. 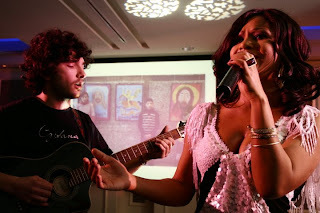 Ukrainian pop star Gaitana, I must say, was amazing. The ball was attended by hundreds of Americans and Ukrainians, plus dignitaries and diplomats from around the world. Here, some ambassador and some famous Ukrainian writer and the chair of Democrats Abroad in Ukraine all dance their hearts out. I am not much of a celebrity-monger, but wasn't that just the Speaker of the House? Accompanied by that famous philanthropist? And there goes the Director of the National Security Council! 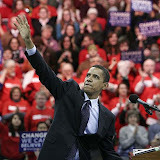 Obama takes an oath. Svetlana pours drinks. Oh yeah, now and then we paused in our festivities to watch the actual historic event unfold in Washington. As an American far from home, I simply felt proud. 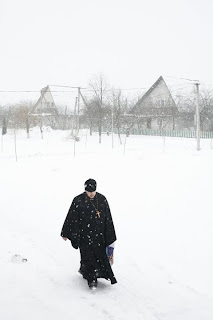 Father Momotyuk Nazarii, the village priest at the church in Novo Ladizhichi, Ukraine, walks through the swirling snow as he goes Christmas caroling with members of his congregation. The group spent two days celebrating Ukrainian Orthodox Christmas, January 7, 2009, by going door to door all over Sukachi and Novo Ladizhichi, singing, offering blessings, and collecting donations for the church. When people gave them candy and fruit, they redistributed it to children and elderly residents. Novo Ladizhichi was built in 1987 to house evacuees from the original village of Ladizhichi following the 1986 Chernobyl accident. This photo was inspired by my favorite photo of Thomas Hoepker's. (His is better). This photo of an old German woman in a snowstorm opens his recent exhibit in Bratislava, Slovakia. Natasha and her friends spend New Years Eve driving around Kyiv in a very long limousine. Shortly before midnight they headed downtown to Maidan Nezhelezhnosti (Freedom Square) to enjoy the crowds and fireworks. I returned to Ukraine a few hours before 2008 ended. Too late to get home and too tired to go out, I spent a quiet evening in Kyiv with my friend Sergii, brainstorming designs for my next photo exhibit. Near midnight, we went for a walk around the block and met Sergii's neighbor Natasha, getting ready to party with her friends in a very very long stretch limo.